These Natural WhiteClassic Crest covers is FSC Certified, Green-e certified and made Carbon Neutral Plus. The Natural White Classic Crest cover deliver exceptional performance on a wide variety of equipment from laser and inkjet printer to color copier and digital printer press. Acid free, Natural Whitecovers are made from 110lb stock and are available unpunched or pre-punched with your preferred binding pattern (see list below). Our window covers have a 1.75" x 4" window that is centered on the front cover 3" from the top edge. With more than 200 options, be sure to pick the right one! Please note that these Covers are custom cut to your specifications. As such they are are not returnable and may take 2-3 business days to ship. If you need them faster, please call us and we will do our best to meet your needs. Cover Size: 8.5" x 5.5" - 11" x 17"
Transcript: These are Classic Crest Covers! The sizes range from 5.5 x 8.5 inches up to 11 x 17. You can choose to have a custom window added to your covers to show off your fancy title page underneath. Classic Crest is great because you can print on them as long as your printer can support the thickness(and it should). The weight thicknesses include 80 pound, 100 pound, 120 pound, and 130. Here is a comparison of them all next to each other. There’s also a duplex option, which is a double sided, two color cover. Duplex covers are about twice as thick as the 80 pound covers. These are Classic Crest Covers! You can customize your covers with one of 8 prepunched patterns, but you’ll have to call our customer service to set that up. 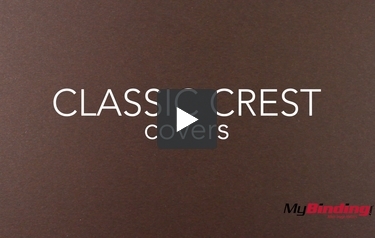 If you are interested in these classic crest covers, you can request a sample to make sure they are perfect for you binding project.